The title ‘Pietà’ alludes to the Ospedale della Pietà, the girls’ orphanage in Venice with which Vivaldi was associated on and off for many years (although never as official maestro di cappella). Perhaps it also conveys the Roman Catholic imagery of Mary’s grieving for the crucified Jesus, which we find recounted in Stabat mater – not written for a girl at the Pietà but a commission from Brescia’s Philippine church in 1712. 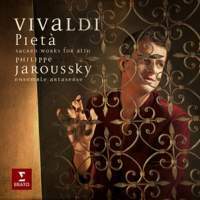 Like all the finest recordings of Vivaldi’s sublime hymn, from Sara Mingardo (Naïve, 7/00) to Daniel Taylor (BIS, 11/09) and every shade of singer in between, Philippe Jaroussky strikes a contoured balance between poetic tenderness in the narrative, emotional expressiveness of the descriptions of Mary’s anguish and sorrow (‘Cuius animam gementem’) and lyrical softness in the arialike verses (such as the whispered piety of ‘Eia mater, fons amoris’). The similarity between passages of Stabat mater and a request for zephyrs to be silent in Filiae maestae Jerusalem demonstrates why musicians usually avoid putting these two works together in the same programme. Ensemble Artaserse sway serenely in the cheerful motet Clarae stellae, scintillate, sung by the girl Getrulda at the Pietà chapel in 1715. After the zesty turbulence of Longe mala, umbrae, terrores (probably written for Rome), Jaroussky’s survey concludes with the gorgeously pathetic Salve regina (RV618): this masterpiece is packed with imaginative details, such as the simple opening passage for unsupported fugal violins, a sublime description of pious sighing in ‘Ad te suspiramus’, the appearance of a pair of oboes in ‘Eia ergo advocata nostra’ and delectable double-orchestra strings in the closing invocation to ‘o dulcis Virgo Maria’.